It’s not a matter of if you’ll cry during Won’t You Be My Neighbor?, Morgan Neville’s affectionate documentary about Fred Rogers, the host of the long-running PBS children’s staple Mister Rogers’ Neighborhood. It’s a matter of when. For those middle-aged adults who watched the show from their playpens in the ’70s and ’80s — like Neville, the 50-year-old director of the Oscar-winning 20 Feet From Stardom, Best of Enemies, and Yo-Yo Ma: The Music of Strangers — it might happen as early the montage in the opening credits, which triggers a rush of latent childhood memories. For those born in the 21st century, who never saw the show, it might happen later, through a couple of clips that resurfaced as viral videos: one of Rogers before the Commerce Committee in the U.S. Senate in 1969, testifying for the merits of public television; and another where he advises to “always look for the helpers” during moments of unfathomable human tragedy. 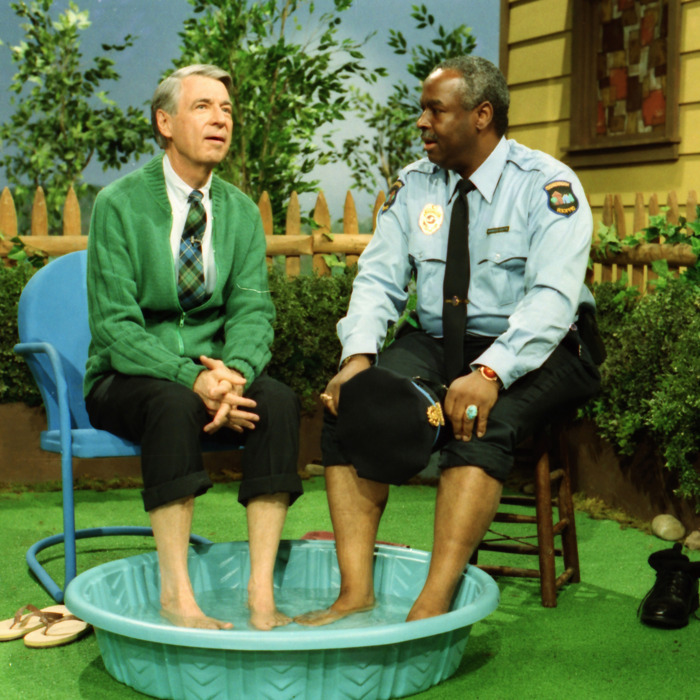 Much has been said about the uncanny timing of Won’t You Be My Neighbor?, which argues for kindness and compassion at a time of exceptional rancor and division in the country, but then, Mister Rogers’ Neighborhood was born of troubled times. Rogers started broadcasting from Pittsburgh in the late ’60s and his gentle, personal, defiantly modest approach to children’s entertainment immediately struck a chord. But Neville makes clear that Rogers wasn’t interested in steering away from the real-world discord that infiltrated the lives of his young audience. Quite the contrary: He had theme weeks on divorce, death, poverty, and war — all aimed at talking kids through the sad and inexplicable things that might trouble their conscience. Though Neville is known mostly for his music documentaries, Won’t You Be My Neighbor? is of a piece with his Best of Enemies, his look at the televised political throwdowns between Gore Vidal and William F. Buckley. In both cases, Neville is revisiting an era where substantive, idea-driven, no-frills programming was possible in the medium, and implicitly laments a time when there’s no place for it. Over coffee between screenings at the True/False Festival in Columbia, Missouri, Neville talked about the generational responses to the movie, the loss of civility in the culture, and where he found the drama in a man who seemed to have no dark side. I had a Proustian response to this movie. Before the open credits were even over, I had a lump in my throat. I’m in my mid-40s, and you’re a little older. I certainly watched the show, but I had stopped watching probably when I was 6 or 7. Which is when most kids stop watching the show. You don’t remember much of anything about being that young, then you see a film like this and it all comes rushing back. Could you talk about the power of that? And are there generational differences to the response to this film? Those of us who grew up with Mr. Rogers have this very specific relationship with him, and it’s something we don’t even really talk about it in the film, but the way he speaks to kids was one-on-one. He never said, “Hey, kids!” It was always, “How are you doing today?” It was this one-on-one relationship. He says in the film he always thought of a single child that he was speaking to. It was never millions of kids. Those of us who grew up with him feel like we have this personal relationship, which I can’t think of another media figure in history that people feel that way about. We have a very deep connection because it speaks not only to us as adults but to part of us that exists in our pre-memory: These things we haven’t thought about, that we maybe couldn’t even consciously remember, except that the film brings some of them back to us. Having screened the film both for younger kids who haven’t grown up on it, or people who were too old to have watched the show, or even international crowds, which I’ve just done a little bit of, the film plays well for them, but it plays differently. I showed it to a group of people and they said it took about 20 minutes for it to find a groove for them. Kind of like, “Who is this? Why do I care?” And then they found it, and it took them away for the rest of the film, which I thought was great. But I find older people and younger people … like, even if somebody didn’t grow up watching him as a kid, they might have a child who did, which is very, very common, or a sibling who did, which is also very, very common. So if you kind of look at the breadth of experience, even if it’s not firsthand, it’s huge. It occurs to me that you might have younger people today accessing him in a different way. I recall the clip of him before Congress making an argument for public television. That went viral. Also his response to events like 9/11, that quote about looking for the helpers. For the younger generation, those viral moments might be their first introduction to Fred Rogers. It says something about the high-school students. It also says something about the quality of Q&As generally. [Laughs.] So, was it an accident of timing that you started doing this now? Or is the film a deliberate response to the times? It was a combination of that and that Senate testimony going viral. There were all these things that made me think Fred Rogers is not who I thought he was, or he’s a lot more than I thought he was. There was a book I read that somebody put out, like a graduate thesis about Fred and the politics of the show, that I thought was really interesting. And then suddenly it went from like, “Really, you’re gonna do a Mr. Rogers documentary?” to like “Really I want to do a Mr. Rogers documentary!” I can’t believe nobody’s done this before. Once I started really digging into it, I got so excited, because it spoke to me not as a kid but as an adult. This is the kind of adult voice that speaks to me, and this was before the election last year. This was, like, me just feeling, and this is something I’ve talked about for years. This is something Best of Enemies is about, too: Where are the adult voices? Where are the adult voices in our culture? I’ve been talking about that for years, because I just feel like the rampant self-interest of everybody in our public sphere has just … we’ve lost this sense of like, “Who’s looking out for where we’re all heading? Who’s worrying about the long-term health and wellness of our culture?” When I started thinking about Won’t You Be My Neighbor… I mean, yes, there’s the clear parallel to Love Thy Neighbor and Fred’s religious underpinnings, but really, to me, it was, “What kind of community do we want to have? What kind of society do we want to have?” Being a neighbor is being a citizen, and those kind of issues are so urgently needed right now. The thing that kind of struck me too is this notion of civility, and the loss of civility, and the film being almost a salve for that in some respects. When the show started, that was the Vietnam era, which was extraordinary fractious, in a way that I was too young at a time to even imagine. So he was fighting those headwinds as well, wasn’t he? Yeah. When we were figuring out how to make the film, one of the initial challenges was, “Where’s the dramatic tension in this story about Fred Rogers?” He’s somebody who seemed like the most consistent character of all time, and when you make a film, it’s, “Where’s your character development?” And I think, really, it was thinking about the film before we started making it, and starting to talk to people, I realized that the big battle in Fred’s career was between him and the world that wasn’t paying attention. He became more and more dedicated and strident and even outspoken as his career went on, as he saw a world that wasn’t following his example, that didn’t get him, and everybody else who was just doubling down on trying to sell toys and sugar to kids. In the early days of television, there was this notion that it could be a great educational tool, but that’s something we really feel a distance from now. But at the time Fred Rogers got started, it seems like maybe he was reviving the idea that television was going to be something that could speak in a constructive way to the masses. For sure. Best of Enemies is a lot about how network TV had a sense of social purpose, and news was seen as a public good. In fact, there were even bylaws written into broadcasting rights that spoke to the obligations of networks to do these things, and they didn’t see news as a profit-making part of the network. Then if you see even that little clip of LBJ giving the speech when he signed the Public Broadcasting Act of 1967, and the kind of thought that went into it, realizing that there was a vacuum at that time even to speak to what public broadcasting could do, and the promise of it … I mean, it was an uphill battle from day one, and as you see Fred testifying, it has not gotten any easier. I’m gonna alienate my friends at PBS, but NPR has probably been a lot more successful than PBS in terms of public broadcasting. But to me, as somebody who started my career in public broadcasting, I believe in the mission of it completely. I often hear people say, “Well, there’s so many channels now, and there’s so many different ways of getting things. Do we really need public broadcasting?” As somebody that creates content, I can tell you there are things that are on PBS that will never be seen anywhere else, except for maybe on a YouTube video somewhere. Like, nobody could afford to make them in that way. Because we have such a pure image of who Mr. Rogers is and what he means to everyone, were you concerned about what would happen if you started turning over rocks? We spent a lot of time shooting this in Pittsburgh. Fred stayed in Pittsburgh in a way, his voice is like a voice of Middle America, and small-town or small-city America, too, which is consistent. The thing I didn’t realize until I started spending time there was that in Pittsburgh, Fred is the most sacred thing next to the Steelers. Right where the rivers meet in downtown Pittsburgh is a statute of Fred Rogers. And everybody I talked to in Pittsburgh, every car, every taxi driver, everybody who knew what we were doing would basically say, “Don’t screw this up.” It was like we were taking on sacred material by talking about Fred. One of the most common reactions I would get from people hearing that I was working on this film was, “Please tell me there’s not a scandal. Please tell me I’m not gonna lose him, too.” And I had a pretty good idea from having done a lot of research before we got into it that I wasn’t gonna find 20 illegitimate children or something like that. I did want to show the biggest problem Fred grappled with in his career, which is people didn’t take him seriously or they thought of him as this cardboard character. I feel like what I’m trying to do is do in this documentary is what Fred wanted to do, which is to understand dimensionality and humanity. Because we still, for the most part, think of him as a cardboard character in a cardigan that Eddie Murphy made fun of. From a filmmaking standpoint, what was your approach to going through the raw material and zeroing in on the aspects of the show or the topics or things that you really wanted to put into the movie. Well, there’s a massive amount of stuff, which is great for an archive doc. Not only were there 900 episodes, but there were all the outtakes, all the field pieces, all the other shows, and a ton of that stuff had never been transferred. It was on film, so that was amazing to get that stuff. But also his papers, and all his correspondence. Everything was at the Fred Rogers Center in Latrobe, Pennsylvania, which is like a beautifully archived library. I felt like it had been sitting there for 15 years waiting for us to show up. You mentioned wanting to express his human dimension, which means finding his flaws and not understanding him as a public saint. How did you go about that? One thing is understanding how much insecurity he had, whether he’s “fat Freddie,” the insecure boy who doesn’t want to be laughed at, or the guy who’s writing a memo saying, “Can I do this anymore? Am I good enough?” I found a letter he wrote to Joanne [Rogers, his wife] when he was just beginning in television and he said, “I don’t know if I’m good enough to do this.” I mean, he was always questioning himself, and that’s just one aspect of the human journey he was on. The message of the show is needing to be loved or loving, but the flip side of that is just intense vulnerability. I think, in a way, they’re connected because a lot of what Fred was saying to kids is what Fred wanted to say to himself in his own childhood. Without a doubt. And I think he was more in touch with his own childhood than most of us are. The fact that he was always referencing these insecurities, and whether it was like remembering being scared of being washed down the drain of a bathtub, and then writing a song about it because this is something kids might worry about it, or getting your tonsils out, or whatever he was doing. He was somehow incredibly in touch with all those insecurities, which helped give him all that material to then do all these shows. Another point the film makes, and it was brought up in the Q&A, was the idea of him really swimming upstream in terms of what you’re supposed to do on television. That had to take a certain amount of insistence and fight on his part. It did! We don’t really go into in the film, but he started in 1968. The next year Sesame Street starts, and Sesame Street is the hip, cool kids show on PBS. Sesame Street was growing fast. By the ’70s, they were doing shows at Madison Square Garden, arena shows for 10,000 kids, and they were selling dolls, and they were doing the sort stuff that Fred refused to do. When he was doing his little public performances, he refused to see more than 30 kids at once. He would do 30 performances a day for 30 kids. He wanted it to be personal. So I think Fred quietly bristled at even what was happening at PBS around him, and I do know in the beginning, Sesame Street was largely informed also by a Madison Avenue kind of attitude about editing, and Fred actually got Sesame Street to slow down. glenn close hive 5:34 p.m.
this! is! jeopardy! 5:21 p.m.
true crime podcasts 4:13 p.m.
game of thrones 3:59 p.m.
one grand books 3:03 p.m.
Michael Shannon’s 10 Favorite Books Charles Bukowski, Dr. Seuss, and more. Hobbs & Shaw Trailer: How Swole Can You Go? So many muscles. Jamie Bell Really Regrets Being a Neo-Nazi in the Trailer for Skin In theaters this July. game of thrones 2:07 p.m.
HBO Would Prefer It If Trump Didn’t Use Game of Thrones Imagery for His Memes Trump responded to the redacted version of the Mueller report with a Thrones meme. Netflix Got Beyoncé’s Homecoming by Paying So Much Money How did the Beychella concert doc end up on Netflix? The same way everything else does. Watch an Astronaut React to Films About Space Former NASA astronaut Mike Massimino breaks down the accuracy of movies about space. Here’s Your First Look at Comedy Central’s New Sketch Show Alternatino Starring Arturo Castro, Arturo Castro, and Arturo Castro. Want to Try Getting Doug With High? Start Here. Doug Benson’s podcast has become a place for all kinds of comedy fans to watch their heroes at their silliest and most vulnerable. Ramy Isn’t Telling a Universal Story. That’s Why It’s So Good. Ramy Youssef’s new Hulu comedy is fantastically adept at identifying the absurdities in its protagonist’s many overlapping, often conflicting roles.